Germany of all countries should appreciate the need—indeed, the obligation—of free societies to take a strong and consistent stand against a murderous and anti-Semitic regime. Yet Berlin, which has gone to great lengths to atone for its own crimes under such a regime, refuses to back the U.S. in confronting the Islamic Republic of Iran, which seeks to destroy Israel. The Trump administration is working to stop Germany from allowing Tehran to withdraw the cash. Richard Grenell, the U.S. ambassador to Germany, urged Berlin to intervene, only to be rebuffed by Johann Wadephul, deputy leader of German Chancellor Angela Merkel's conservatives in parliament. Wadephul said the transaction "should not be blocked on political grounds if it passed legal muster," according to Reuters, reflecting the sentiments of Merkel's cabinet. The Iranian plan could be legal—that remains to be seen—but regardless, it would be shameful and dangerous of Germany to facilitate the transfer when it could block it. Berlin has made repeated efforts to continue providing Iran with sanctions relief, hindering U.S. efforts to push back on the Islamic Republic's brutality and belligerence. German businesses rushed into Iran after the nuclear deal—officially called the Joint Comprehensive Plan of Action, or JCPOA—was struck in 2015, with the German government eager to improve bilateral relations. After President Donald Trump withdrew the U.S. from the nuclear accord in May, promising to re-impose sanctions on Iran lifted under the deal, Germany has worked furiously to preserve the agreement and continue business with the Islamic Republic. The German government last month created a special office—what the Economy Ministry calls an "Iran contact point"—to advise companies worried that their business dealings with Iran may trigger U.S. sanctions. 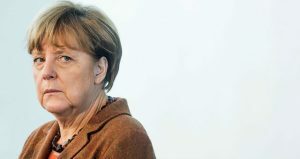 The ministry stressed, as Merkel did this week, that Germany is committed to its sanctions relief for Iran. Merkel added that individual firms should decide on their own whether they want to invest in Iran, without indicating the slightest hint of a tougher posture toward Tehran. Berlin's moral compass is no longer pointing north. It supports Iran's Islamist theocracy over the U.S., sacrificing its soul. For the sake of what? Commercial interests are likely not the main motivation, despite many journalists and analysts' claims to the contrary. After all, Germany's exports to and imports from Iran make up a tiny sliver of its total trade (0.27 and 0.032 percent in 2017, respectively). Another possible explanation for Germany's behavior is political indignation toward Trump. Trump's demand that NATO members, especially Germany, spend more on defense certainly irked Berlin, as did his proposed tariffs on steel and aluminum exports to the U.S. and general hostility toward free trade. Most western European leaders clearly loathe Trump, none more so than Merkel and her colleagues. "Where has our dear friend Barack gone?" I imagine they ask behind closed doors, seeing Trump's behavior and nationalism as simpleminded and unsophisticated. Moreover, European leaders saw the decision to withdraw from the Iran deal as a slap in the face, heightening their determination not to appear to be at the mercy of Washington's whims and fearful of its sanctions. A third explanation is more abstract. It concerns Germany's lack of military power and refusal to believe that military force can and should be used to resolve international disputes. There is an ideology deeply entrenched in parts of Europe, especially Germany and the European Union, that sees negotiations and reconciliation, bolstered by trade and other forms of economic interdependence, as the only way to settle conflicts between states. Grand diplomatic achievements, like the JCPOA, are the ultimate prize. Trashing such a deal, therefore, is a sin of the worst kind in this secular religion. Diplomacy between sophisticated bureaucrats, according to this worldview, is the way to keep conflict at bay, to keep the barbarians—those who believe in the efficacy of hard power—from entering the city gates. The theory underpinning this belief system is that everyone, no matter how hostile, will be seduced by the West's goods, services, cafes, and money. And so the hard men of Iran will eventually lay down their weapons, choosing instead to enjoy the latest European fads. Of course all of this is hogwash, but don't doubt for a moment how firmly German leaders believe it—because if it isn't true, then Germany has no real power on the world stage, at least to resolve the most pressing matters. Germany, like other European countries, defends its Iran policy by saying the only alternative to the JCPOA and reconciliation is war. But Iran, like any revisionist power, will only become more emboldened if it does not meet resistance. That goes for all aspects of Iran's belligerence—from its nuclear program, to its own internal repression, to its complicity in Syria's mass slaughter. Germany does not seem to recognize the irony of its approach to Iran. Merkel was quick to take in refugees from Syria en masse—a noble if misguided policy—before she reversed her decision. Yet Merkel's government eagerly moves to strike business deals with Iran, indirectly funding the regime that most robustly supports Syrian President Bashar al-Assad's war machine—which caused the refuges to flee to Europe in the first place! Berlin has an opportunity to take on a global leadership role in countering Iran and taking a stand against true totalitarianism. To do this, Germany must speak out against the regime and support the Iranian people protesting against their government. This means supporting freedom and human rights, not just paying them lip service. The Germans must also separate the Iran issue from other contentious ones to work with Trump to ensure sanctions are effective, to contain and ultimately roll back Tehran's imperialist expansion across the Middle East, and to ensure Iran never gets a nuclear weapon. Germany also must confront Iran about its egregious anti-Semitism, including its Holocaust denial and determination to destroy Israel. More than 70 years ago, six million Jews were slaughtered in the darkest chapter of human history. Germany has a moral obligation to ensure that Iran's repeated calls to exterminate another six million never come to fruition.